This is usually where the offended partner ends up crying or emotionally shutting down. I can literally see the shutters fall over their eyes; they have left the conversation and everything comes to a standstill. I think one of the most basic human needs is the need to be known as we are. This need to be understood and validated is what causes a partner to continually bring up an offence. I see this happen often in my office. The injured party repeatedly brings it up in an effort to resolve something that does not feel closed to them. It is not an effort to punish, but to bridge the continued disconnection they feel with their partner because of an unresolved issue. Human beings come to conclusions about another’s sincerity and authenticity in very complex ways. They take into account a number of sources of information: content of the message, how the content is delivered (tone, volume, speed, and language), emotion, and body language. People can feel a disingenuous apology and will reject it because of its insincerity. The result is that the offense keeps being brought up because the offended person feels neither understood nor empathized with. Repairing a relationship after a rift is a skill that most couples struggle with and, if not mastered, can cause the relationship to flounder. Repair helps you to draw closer to one another instead of drifting apart; rebuild connection as opposed to causing greater disconnection. Ultimately, it cannot happen if empathy and understanding are not present. The foundation of an effective apology rests on two key words: “understand” and “empathy”. To understand means to grasp the significance, implications, or importance of something. And to have empathy for someone is to directly identify with and understand the vicarious experience of another person’s situation, feelings, and motives. There’s a subtle difference between the two – understanding is about acknowledging the importance of and its impact on someone else. In other words, it might not be important to you, but to them it is more serious. Empathizing is literally feeling what they feel; seeing things the way they see it. 2. Put your feelings aside. In other words, momentarily put aside your personal feelings, needs, wants, and complaints. Note that I said momentarily. You are not negating, diminishing or ignoring yourself in any way. You are simply putting them aside for the time being. True empathy demands you put your own feelings aside to understand and validate someone else’s. When you have behaved badly and made poor word choices, it is particularly difficult because it requires that you push aside the need to defend yourself. It also requires you to be vulnerable and consider the impact you have had on someone else. 3. Get behind your partner’s eyeballs. See the events from their perspective. How would you feel if a stranger on the street had done the same to you? Name a few feelings that would be probable for you. How would you respond? What would you do? Would you do the same to one of your parents? To your child? To your best friend? To your boss? What would be the consequences if you had done the same to a stranger on the street? To your boss? To your child? To your best friend? To your parent(s)? If someone treats you poorly, how would you relate differently to this person? Would it draw you closer or farther away? Would you avoid them? Would you walk on eggshells when you were around them? If you feel fear, how would you protect yourself? Would you question your value to them? What could a stranger conclude about you as a person if they had witnessed what you did and/or said? You can’t fake understanding and empathy with someone who sees you regularly, if not on a daily basis. Okay. That was a bit of a speech. But, you get the picture. So, how do you know you have understood your partner’s experience? They will let you know. It doesn’t matter if you feel you understand. What matters is whether your partner feels you have understood. Remember, what I have outlined is only the bare bones of an apology. However, a simple formula will not result in the connection you want unless you add understanding and empathy. Only then can sincerity come through naturally. 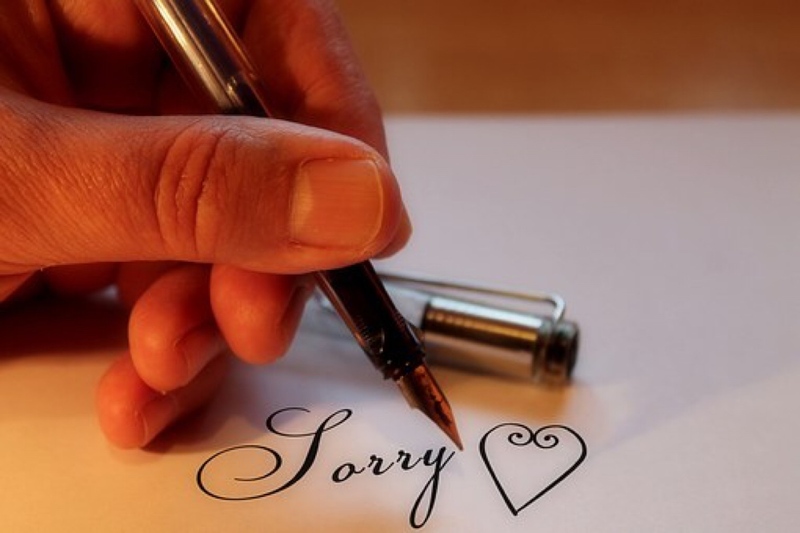 The more you apologize, the better you get at it…. …and, funny enough, the less you need to do it. To Post or Not to Post…Pics of Your Kids?